Nuby Turtle-Shape Pacifier | Yellow | Massage and stimulate your baby's gums. 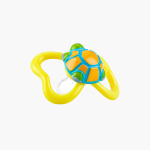 Provide a comforting effect to your baby’s sore gums during the teething period with this attractive BPA-free pacifier. Shaped like a turtle, it is crafted using the highest safety norms. The unique shape of this pacifier allows proper air circulation and prevents all types of irritation.